The cricketing world has been a witness of yet another incident where a batsman has floundered as a result of a well-executed short-pitched delivery. This time around, the victim is Sri Lanka's valuable top-order batsman, Dimuth Karunaratne. He got a nasty blow at the back of his helmet above the neck region, courtesy Australian speedster Pat Cummins who operated a 142 kmph bouncer in the 31st over of the game. 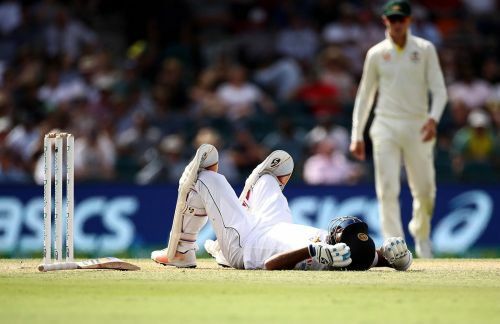 Karunaratne, who was batting fine with 46 runs to his name, immediately fell to the ground and was attended by the medical staffs of both the hosts and the visitors. However, on the brighter side, it has been reported that the left-handed batsman was still speaking and moving his hands, in a state of consciousness. 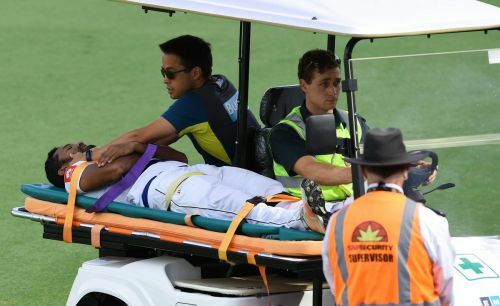 Karunaratne then departed from the ground with the help of a stretcher and a huge round of applause from all the spectators. Karunaratne, who was taken to an ambulance, is set to be transported to the hospital for some additional medical assessment and scans. Also, the Aussie players were kind enough to visit the victimized player and inquire about his well-being. The hosts are in a comfortable position to bag the match after Karunaratne's departure. Soon after Karunaratne left the field, Australian offie Nathan Lyon cleaned up Thirimanne, who was batting at 41. It was then Cummins who bowled out Kusal Mendis for just 6 runs. Dinesh Chandimal was then sent back to the pavilion by Starc as wicketkeeper Tim Paine successfully caught the edged ball. Australia declared at the score of 534-5 in their first innings, after three of their batsmen (Burns, Head, and Patterson) scored a century each. While Joe Burns topped the batting charts for Australia in the 1st innings with 180 runs, Head and Patterson too displayed a beautiful batting masterclass, scoring their maiden Test hundreds. Head went on to score 161 runs, before being finally dismissed by Fernando, whereas Patterson remained not out at the score of 114 runs. Let's hope everything goes fine for the 30-year-old Karunaratne and he recovers well soon.